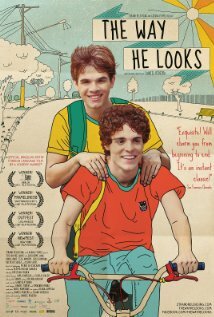 Leonardo and his best friend Giovana live two streets apart and attend the same high school. Neither of them has been kissed and Leo, who is blind, is convinced that no one will want to share that moment of intimacy with him. New boy Gabriel sends Giovana into an emotional whirl and she makes clear her romantic interest. Hormones rage but it is Leo who forges a lasting bond with Gabriel when they team up for a school project. As the boys spend more time together, their feelings for each other intensify. The Way He Looks is not currently showing anywhere.